We are always adding new lines to enhance our customer experience. This year we added KUHL, Pelagic and HUK for Men, Women and Kids! 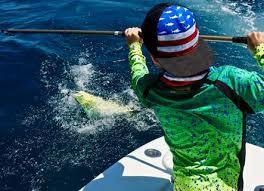 Kids fishing clothes by AFTCO and Pelagic keeps the youngster in your family protected from harmful UV sun rays. Our selection of kids fishing apparel, fishing shorts and kids fishing shirts include AFTECH and VaporTek fabrics that allow for you child to stay comfortable on the water. Our boys fishing clothing can also be worn by the girls in your family. If you are going to take your kids out fishing, AFTCO and Pelagic are a must. Stop by and check out our new technical shirts and caps from SIMMS – exclusively at Island Outfitters! We can’t forget the Ladies – Fresh Produce Apparel all new look, fresh new colors! Colorful & Comfy Clothes with a Coastal Sense. Watch their video to learn more about how Fresh Produce was started, why women love their clothes and how it can inspire you.